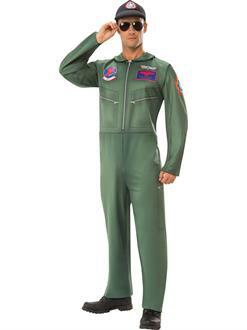 Before heading out on the highway to the danger zone, put on the Top Gun Adult Costume. This two-piece set is inspired by both actual fighter pilot uniforms and the outfits worn by Tom Cruise (Maverick), Val Kilmer (Iceman) and Anthony Edwards (Goose) in the classic film. "Top Gun" and other fighter pilot insignia are printed on the chest and arms. Glasses are not part of the set.